Are you looking for ways to market and sell your music? From individual works to complete catalogues, tutti.co.uk can help you to promote and sell your music products. More than an online shop, with our musical expertise and over 13 years’ experience of online sales, we can enable you to maximise the visibility of your products and earn from sales. With the right marketing advice and ecommerce tools we’ve seen that individual musicians and independent music publishers of any size can compete worldwide, right now. Make the decision now to become a tutti seller. With only a few minutes of setup you can start selling your music online, worldwide, 24 hours a day. — Tim Gill, Managing Director, Music Trading Ltd. Expand your market share. Our marketing expertise and web platform will help you connect with new customers at home and from around the world. Every day we ship music to destinations as diverse as Japan, the USA, Australia and Germany, as well as to customers in the UK. Hassle-free stock management and shipping. You arrange a one-off shipment of your scores or CDs to our warehouse and we take care of everything for you from then on. Storage, stock taking, packing, worldwide shipping and returns – all handled smoothly and professionally on your behalf. Delight your customers with a simple, reliable and secure online shopping experience and fast worldwide shipping. Our shop consistently wins great feedback from happy customers. Make sure your products get seen. tutti has a purpose to sell on behalf of musicians and music publishers only, and no one else. We hand process every title in our catalogue to make sure that only high quality music products are offered. Your products won’t get lost among thousands of unrelated items, and the clear focus of our website means we attract musicians and music lovers, each of whom will be a potential customer for you. Benefit from our marketing know-how. We have applied and proved the value of online marketing using google adwords and advertising, facebook and facebook advertising and we have a growing community of subscribers who receive our marketing emails and our popular information ezine, tutti-talk. When you sign up with tutti.co.uk, you get immediate access to our easy to use product management tools. Simply log in to our website and you can start to add products straightaway. Adding new products is easy – just select the type of product you want, whether it’s printed sheet music, a CD or a sheet music or track download. Our product dashboard gives you an overview of all your titles, letting you review your products and sales figures at a glance. This gives you quick access to view or edit any of your products, or remove them from sale at any time. 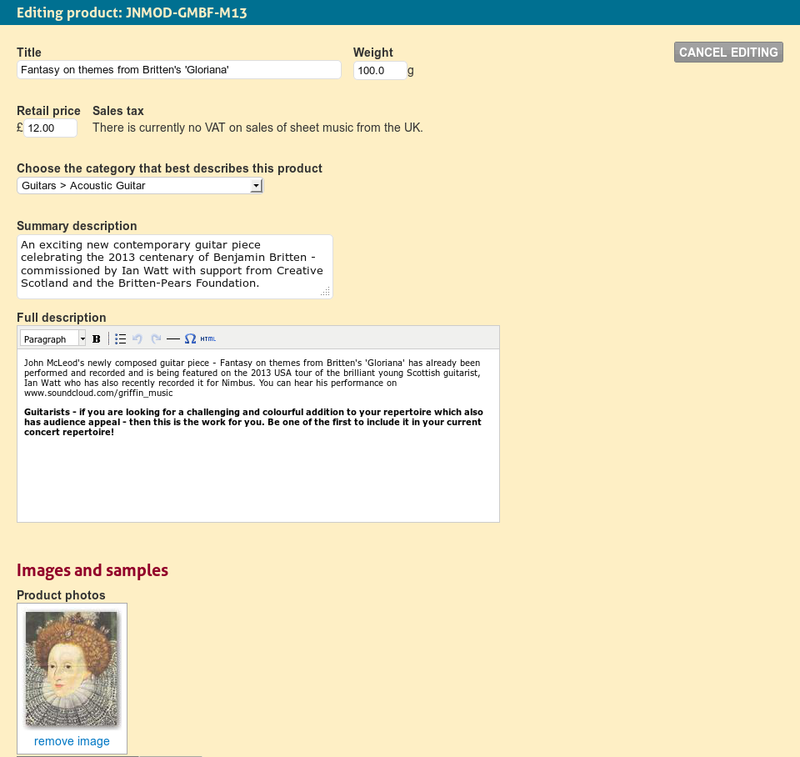 Our product editor lets you customise exactly how you want your product to appear to customers. Here you specify information such as the title, retail price you are selling for, the weight (used to calculate postage) and the section of the site you want your product to appear in. The better you can describe your product, the more attractive it will be to customers. We encourage you to add as much detail as you can to your product’s description and to upload photos and samples of your product. You can also link to video performances of your work. There are further options on this screen tailored to music products, allowing you to choose your music’s instrumentation, printed format (eg score + parts), composer or artist information, and other items. All this goes into making your music easy for customers to find and attractive to buy. 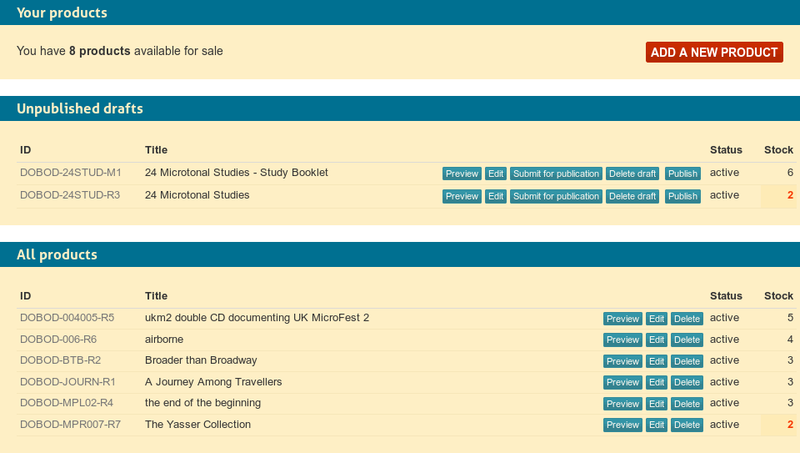 These are all features we’ve developed to support music sales, so you won’t find these on generic ecommerce platforms. We’ve worked hard to make our system easy to use. There is online help shown next to almost all fields, and no limit on the number of revisions you can make before putting your product online. You can take as much time as you need to become familiar with all the options we offer before you launch your products for sale. You also get free downloadable guides showing you step by step how to get up and running on tutti as well as exclusive marketing tips that you won’t find elsewhere. Plus we are always happy to provide individual help and advice whenever you need it. If you have a pre-existing catalogue that you would like to make available, we can also offer tools to import your products into our system in a single batch, without the need to create each title individually. These tools can be customised to work with your existing stock control software – please contact us for more information. Which of the tutti seller services is right for you and your music? We offer 4 levels of service, depending on the size and needs of your business. Each level is based on the marketing features you would like to benefit from and the number of products you wish to sell. All of our service levels can include warehouse storage and despatch services, freeing you to concentrate on the creative side of your business. If you already have a warehouse and despatch operation, we can accommodate this as well. Our specialised marketing services can include advertising your products via online advertising campaigns on Google and Facebook, social media campaigns and featuring your products in promotions on the tutti website and email newsletters. All of our marketing material is created and reviewed by our editorial team to make sure it fits your product line. For this starter package at £6.50 per month (that’s just £1.50 per week) + VAT, you will have the benefits of warehousing and despatch with access to the sellers site and the additional benefits of marketing tips, inclusion in group emails and other selective features for 1 to 15 warehoused products plus 1 to 15 downloadable products. If you wish to take advantage of featured mentions of your products on the tutti Facebook page, in email marketing campaigns and tutti talk, then for as little as £2.54 per week as a monthly subscription of £11.00 + VAT, this may be the package for you. At this level you can list 1 to 30 warehoused products and 1 to 30 downloadable products. This is for sellers who are looking to give their products the broadest marketing initiatives. Premier includes all of the above with personal advice on marketing your products including creating landing pages dedicated to your products and running advertising campaigns for you on Google and Facebook (advertising costs are additional). This is for 1 to 50 warehoused products plus 1 to 50 downloadable products and is great value at a cost of £4.04 per week for a monthly subscription of £17.50 + VAT. For publishers and sellers who wish to have a tailor made service for selling your goods there is a Bespoke option which we will be happy to discuss with you. This custom built package includes marketing campaigns to promote your specific products, testing the results continually to increase your visibility and sales. The Bespoke option also offers you the opportunity to despatch from your own warehouse and one to one contact on the promotion and sales of your products. How will you benefit from selling on tutti.co.uk? Setting the price at which you want to sell. Uploading product images, page and sound samples. Creating links to video on YouTube which will display directly alongside your product. Respond to enquiries about your music. Help you to promote your music most effectively. Advise about display and marketing. Offer a service for synchronization requests. Be confident your products are always available. Monitor your sales and stock levels. Find all the information you need on how to sell with tutti. † These services are paid for separately, costs vary according to usage. * Bespoke package includes all Premier benefits, plus services customised to suit specific requirements. I’m interested in selling music online, what’s next? Send us an email to sell@tutti.co.uk saying that you are interested in selling with tutti and we will contact you straight back to talk to you about the music you want to sell and answer any questions you may have. If tutti seems right for you then we will arrange your account and give you all the help and support you need to get your first products online. Fill in the form below and we will contact you to answer any questions you may have and talk to you about the music you want to sell. If tutti seems right for you then we will arrange your account and give you all the help and support you need to get your first products online. If you’d prefer to talk by phone then give us a call (our number’s just below) or leave your contact details via the form on the tutti website and we’ll phone you back. If you’re only just beginning to think about online sales and whether or not it will work for you then don’t be afraid to get in touch anyway. We have many years of experience in marketing and selling music online, and we will try to give you the best advice we can for your individual situation, regardless of whether you end up choosing tutti or not! We pride ourselves on the highest standard of service, and that starts from the very first time you get in touch. We reply personally to every enquiry and we will never give you the hard sell or send you unwanted marketing messages.